Do you have history about our community to add to this site? · 1992: Shelter and community meeting hall during the Cleveland Fire emergency; 1st Wild Game Feed; began Tuesday Night Bingo; built our commercial kitchen. · 1993: Revived Logging Days & built memorial to pilots killed during Cleveland Fire; 1st annual FREE Thanksgiving Dinner; Poverty Playhouse opened. · 1994: 2 Quakeburger Feeds (over $4,000 raised for LA victims); Blood Drive; 1st annual FREE Christmas Dinner; first annual 4-H Cake Auction at the Center; See's Candy sales on 5 holidays; nonalcoholic New Year's Eve Bingo. · 1995: 1st Sheriff's Citizens Academy; 1st CPR, Health & Safety Expo; Sat. community market; monthly pancake breakfasts (2nd Sunday); July 4th Barbecue. · 1996: Communications command post during December flood and snow emergency; 1st annual FREE Easter Dinner; 1st Christmas Parade. · 1997: Hosted the Red Ribbon walk; fed over 1,000 people at our FREE holiday dinners; started community food, clothing and toy drive. · 1998: Hosted Shriner Command Parade; sponsored Logging Days at the Fair Grounds Harvest Fair; host for the Sierra Mobile Health Clinic. · 1999: Hosted the 1st annual Community Safety Day with numerous local and county agencies participating; hosted the Wagon Train Breakfast to show our appreciation to this historic event. · 2000: Raised $15,000 through various fundraisers to put a new roof on the Community Center. · 2001: Became a designated Food Distribution Site by the Food Bank of El Dorado County for USDA commodity distribution and the Senior Brown Bag program; in collaboration with Pollock Pines Central in process of assisting them in opening a Family Resource Center at the Community Center; donated land use and water for the Community Garden; took over joint sponsorship of the Fourth of July Parade; sponsored a fundraiser for the Police and Firefighters in New York City after the events of 9/11/01 and raised over $22,000, fed over 1,500 people and made a thank you card with local signatures that measured over 300 feet. · 2002: Hosted 1st Annual Dogwood Festival and Craft Fair; held several town hall meetings to discuss issues in our community; purchased and installed a commercial dishwasher; hosted the first annual Halloween Carnival; and did major electrical upgrade (light switches instead of circuit breakers). 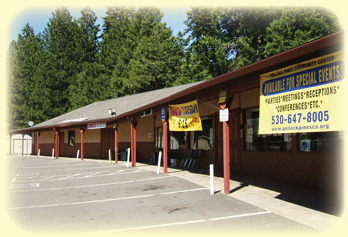 · 2003: Installed heating and air conditioning in the two offices; installed 3 television Bingo monitors; purchased a new computer; constructed a six-sided historical mural kiosk celebrating the rich history of El Dorado County; and received community enhancement funds from the El Dorado County Board of Supervisors to pay down the Center Mortgage. · 2004: Began a new special event each Second Sunday: Twilight Swing Dances featuring Big Band music and appetizer buffet; hosted the annual Wagon Train stop in Pollock Pines; painted the outside of the Center, Banquet Room 1, began work on Room 3 to establish a computer learning center, and converted room 4 into a theater-seating room with a stage suitable for training, weddings, meetings, etc. ; designated Disaster Shelter during the October Fred’s Fire; and began a fundraising effort to pay off the Center mortgage. Just think what the next years might bring. We are only limited by our imagination! Our major goal in the coming years is to pay off the mortgage on the Center facility. And this will be possible through the support and donations of individuals, businesses and organizations. Working together we can make this goal a reality. · 2005: Check out our history presentation! Check out the year 2013 for our center. The Dogwood Garden Club, Rotary and CEDAPP provided a great deal of service to give our center a facelift on January 20th. Read the thanks for their service here.